Born to the Saxon nobility, the son of Blessed Bezela of Goda; as an adult he was heavily involved in the power politics of his day. Educated in the abbey of Saint Michael, Hildesheim, Germany. Priest. Canon at the imperial chapel at Gozlar, Hanover. Chaplain to Emperor Henry III. Bishop of Meissen in 1066. Participated in the synod of Forcheim, Germany in 1078. He spent a year in prison for backing the nobility and Pope Saint Gregory VII against Emperor Henry IV over lay investiture and the control of the Church by the State. At one point he was summoned to Rome, Italy; he ordered the canons to lock the cathedral while he was gone in case emperor Henry tried to occupy it. Henry did, and threw the keys of the cathedral into the river as a symbol to show no one could lock the church against him. When Benno returned, he went to the river and found the key; legend says it was protected by a fish. Following the death of Pope Gregory VII, Benno pledged his allegiance to the anti-pope Guibert, but in 1097 he returned to support of the lawful Pope Urban II. Even with all the polical involvement and turmoil, Benno never lost sight of his calling as a diocesan bishop. He visited parishes, preached and conducted Mass, enforced discipline among his clergy, and fought simony any place he found it. He was an accomplished musician, supported music and chant in the churches and monasteries, and wrote on the Gospels. In his later years he served a missionary to the Wends. Benno continued to be an involved and controversial figure in politics even after his death. His biographer, Jerome Emser, worked a lot of Church versus State material into the book. Martin Luther wrote a furious diatriabe against Benno's canonization. A pretty girl with a fondness for clothes and no apparent religious vocation, Lutgardis was sent to the Black Benedictine convent near Saint Trond at age 12 because her dowry had been lost in a failed business venture, and there was thus little chance for a life as a normal, married lay woman. In her late teens Lutgardis received a vision of Christ showing her His wounds, and in 1194 at age 20 she became a Benedictine nun with a true vocation. She had visions of Christ while in prayer, experienced ecstacies, levitated, and dripped blood from forehead and hair when enraptured by the Passion. Chosen as prioress of her community in 1205, she repeatedly refused to be abbess. The Benedictine order was not strict enough for Lutgardis, and on the advice of her friend Saint Christina the Astonishing, in 1208 she joined the Cistercians at Aywieres (near Brussels in modern Belgium) where she lived for her remaining 30 years. She displayed the gifts of healing, prophecy, spiritual wisdom, and was an inspired teacher on the Gospels. Blind for the last eleven years of her life, she treated the affliction as a gift - it reduced the distraction of the outside world. In one of her last visions, Christ told her when she was to die; she spent the time remaining in prayer for the conversion of sinners. Son of Saint Julitta. When Cyriacus was a small child, his mother was sentenced to death at Tarsus during the persecutions of Diocletian. Cyriacus made a childish attack on Alexander, the sentencing magistrate, and announced that he was a Christian like his mother. The angry magistrate threw the child to the ground, smashing his skull and killing him instantly. Some scholars claim that the entire story is fiction, and there is no question that earlier writers hugely embellished this popular and frequently retold story. Blessed Charlemagne dreamed he was saved from death by a wild boar during a hunt by the appearance of a child who promised to save if Charlemagne would clothe him. The bishop of Nevers explained that the child was Cyriacus, and that he wanted the emperor to repair the roof of Saint Cyr's cathedral. This led to the Cyriacus' representation as a naked child riding a wild boar. A group of five Christian laymen, four farmers and a doctor, from the same village in the apostolic vicariate of Central Tonkin (in modern Vietnam). During the persecutions of emperor Tu Duc, they were each ordered to stomp on a cross to show their contempt for Christianity; they each refused. Imprisoned, tortured and martyred. Mother of Saint Cyriacus of Iconium. Widow. Moved from Iconium to Isauria to avoid persecution as a Christian. Tortured and martyred during the persecutions of Diocletian. Legend says that from the site of her burial there erupted a miraculous spring of water that cured the sick and improved the health of those who immersed in it. Bishop of Arles, Gaul (modern France) in 546. Founded a monastery and convent in Arles, and brought many relics to them including a piece of the True Cross. The Rule he gave each of the houses in his diocese stressed devotion to the saints and martyrs. Assisted at the Council of Orleans in 549. Referred to himself as Aurelian the Sinner. Papal vicar of Gaul under Pope Vigilius, from whom he received the pallium, one of the symbols of his high office. Son of a poor baker. First bishop of Amathus (modern Limassol), Cyprus in the early 5th-century. Fought to rid Cyprus of its remaining pagan culture, idols and worship, particularly that related to Aphrodiate. Saint Joseph the Hymnographer composed an Office in his honour. Saint John the Merciful wrote a biography of him. Priest and parochial vicar in the diocese of Cahors, France. Imprisoned on a ship in the harbor of Rochefort, France and left to die during the anti-Catholic persecutions of the French Revolution. One of the Martyrs of the Hulks of Rochefort. Brothers. Ferrutio was a priest, Ferreolus a deacon. They were sent by Saint Irenaeus of Lyons to evangelize the area of Besançon, France where they worked for 30 years. Martyrs. Brother of Saint Justina of Mainz. Bishop of Mainz, Germany. When the Huns attacked Mainz, Aureus fled briefly into exile, but returned. While celebrating Mass in the cathedral, he, his sister and everyone else there were massacred during the Liturgy of the Eucharist. Martyr. Bishop of Telese, Italy. Saint Equizio of Telese served as his deacon. Carthusian choir monk of the Charterhouse in London, England. 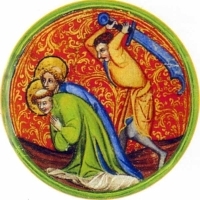 Martyred for refusing to accept King Henry VIII as head of the Church. Sixth century son of Budic, prince of Cornouaille, Brittany (in modern France), who was forced into exile at Dyfed, Wales. Budic later returned to Brittany, but his three sons preferred Wales where they all became holy men. Ismael was the spiritual student of Saint Teilo of Llandaff who ordained him bishop of Menevia, Wales. Several churches are dedicated in his honour in Pembrokeshire and Carmarthenshire, Wales. Sister of Saint Aureus of Mainz. When the Huns attacked Mainz, Justina fled briefly into exile, but returned. While celebrating Mass in the cathedral, Justina, her brother and everyone else there were massacred during the Liturgy of the Eucharist. Martyr. Hermit in the Ardennes region of France. Ordained by Saint Remigius of Rheims. The town of Chaumont grew up around his titular abbey and church in the archdiocese of Rheims, France. Indulgences for pilgrimages to Berhaldus' shrine were granted in 1451 and 1466. Spiritual student of Saint Patrick. Bishop. Helped Patrick evangelize Ireland. His shrine at Orran was a place of pilgrimage for centuries, apparently survived into the 18th century. Bishop of Luni, Italy. Martyr. Mercedarian friar. A member of the Roman Curia, he resigned his position to work to free Christians enslaved by Muslims. Freed 200 of them in the Andalusia region of Spain. Spiritual student of Saint Columba of Iona. Deacon. Helped found the monastery of Reachrain (modern Lambay Island), Dublin, Ireland, and served as its abbot. Hermit at Beaumont, archdiocese of Rheims, France. Sixth century. While listed in multiple martyrologies, no details about him have surived. Bishop of Nantes, France. Saint Gregory of Tours testified to his holiness. Sixth-century bishop. Pilgrim to Rome, Italy. Settle in the village of San Felice near Narni, Italy. Sixth-century bishop. Pilgrim to Rome, Italy. Settled in the village of San Felice near Narni, Italy. Bishop of Llanbadarn, Wales. Several Welsh churches are dedicated to him. Companion of Saint Ursula. Martyr. Nun in Llangurig, Denbigshire, Wales.